In three of the four most recent fiscal years, Apple's revenue growth has exceeded 50%. The exception is the recession year of 2009 in which the rate of revenue growth dipped to 14.4%. FY 2012 will have 53 shipping weeks. This additional week will add to the revenue growth rate in the December quarter and the fiscal year. The graph below illustrates Apple's revenue growth rates in fiscal years 2008 - 20011 and my anticipated 57% revenue growth rate in FY 2012. I recently updated my Apple Unit Sales page to include units sales by product line for the most recent twelve fiscal quarters. Please see the page for detailed historical unit sales information. I anticipate revenue from iPhone handset sales to rise more than 82% to over $85 billion on 132 million handsets sold. In FY 2011, iPhone unit sales rose about 80%. I expect FY 2012 unit sales growth to track closely with the prior year outcome. The Sprint agreement and the product's greater global reach will keep unit sales on a high growth track. Without a doubt the iPhone is currently Apple's most important product and will deliver another year of strong revenue and unit sales gains. 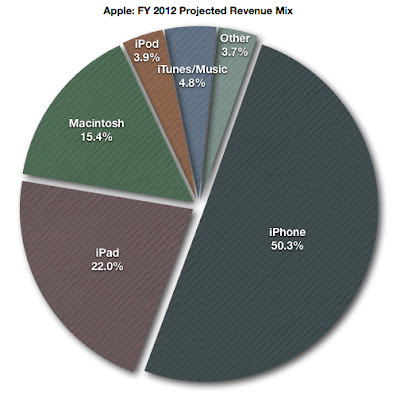 In FY 2012 I expect iPad revenue to rise about 83%. In my view, outside of the Apple iPad a market for tablet-style products does not currently exist. Apple continues to pioneer the global market for tablet products and the release of the iPad 3 will benefit unit sales in the second half of the fiscal year. Year-over-year unit sales growth will moderate from the pace seen in the second half of FY 2011, but the iPad remains in a nascent stage of global market development. iPad revenue growth of 80% to 90% can be sustained at least through FY 2013 as the market for tablet-style products expands and consumers continue to migrate from conventional PCs to Apple's popular product. Of all of Apple's major product lines, the Macintosh delivered the most surprising results in FY 2011. Last fiscal year the Mac delivered 22.5% revenue growth. In FY 2012, I forecast Macintosh revenue to rise about 20% to over $26 billion on unit sales of over 20 million units. This growth is in contrast to the global PC industry that has entered an era of economic decline. In addition to rising revenue, the Mac will continue to gain domestic and global market share throughout the year. For the first time since the opening of the iTunes Music Store in 2003, I expect revenue from this segment to exceed the revenue generated from iPod sales. I expect revenue from iPod sales to fall by as much as 12.5% to under $7 billion and revenue from the segment inclusive of iTunes to rise 30% to well over $8 billion. At the time of this writing there's much speculation Apple will enter the HD TV market as early as the second half of FY 2012. Because there are no formal announcements from Apple concerning planned new products, revenue from new products are not factored into my FY 2012 projections. I will update these projections upon formal announcement from Apple about new product plans. The graph below illustrates Apple's rates of earnings per share growth over the most recent four fiscal years along with my 66.2% projected eps growth rate in FY 2012. My forecasts calls for 25.5% of recognized revenue to flow to the net income over the fiscal year with an average of 945 million shares outstanding. The projected eps growth rate in FY 2012 is similar to the actual FY 2010 outcome. The extraordinary 82.7% eps growth rate in FY 2011 was influenced by the first full year of iPad unit sales. Economies of scale reduce Apple's costs per unit. The 3GS iPhone is in its third year of production and the new iPhone 4S handset borrows the form factor from its predecessor. While the iPad may undergo a change of form in early spring, rising unit sales will produce attractive gross margins. I'm forecasting average gross margin on the year of 41%. Apple's operating expenses consisting of R&D and general, selling and administrative expenses will fall below 9% of revenue, delivering a boost to net income. The Apple retail stores as profitable marketing, advertising, sales and service centers assist in dramatically reducing sales-related expenses as a percentage of revenue. Apple's ability to maintain the retail margin on products sold through the company's direct sales channels further reduce operating expenses as a percentage of revenue. Rising international sales reduce the average tax rate Apple pays on net income. As the percentage of revenue from sales outside the US continues to rise, it has a positive impact on the company's average tax rates. I forecast an average tax rate slightly under 24% on over $43 billion in net income. In FY 2011, Apple's average tax rate was 24.22%. Rising revenue, high margins, a lowered percentage of revenue consumed by operating expenses and an average tax rate just below 24% of net income will deliver over a 66% rise in earnings per share to $46. At Apple's closing price on Black Friday of $363.57, the shares are trading at 13.13 times trailing 12-month earnings of $27.68 and 7.9 times anticipated FY 2012 earnings. This is despite almost $87 in cash standing behind each outstanding share as of the end of the September quarter. I maintain a $640 12-month price target representing a valuation of 13.9 times forecast FY 2012 earnings per share.